2014 is off to a good start! Stan Lee introduces this exclusive clip of Electro (Jamie Foxx) bringing fireworks to Time Square and Spidey (Andrew Garfield) swings to the rescue. The special effects in this scene look incredible. I love the way the electricity constantly flows through Electro’s veins. Let’s just hope the film doesn’t suffer from toomanyvillainsitus. Check out the clip below and let me know what you think. 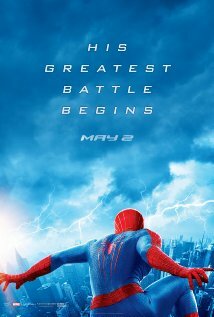 The Amazing Spider-Man 2 is opens in theaters May 2, 2014. Posted in Uncategorized and tagged action, Andrew Garfield, clip, comic book, Electro, Jamie Foxx, marvel, Peter Parker, Special effect, Spider-Man, Stan Lee, superhero, The Amazing Spider-Man 2, Time Square. Bookmark the permalink.